Green is now mainstream. 83% of adult U.S. consumers claim to be some shade of green. But addressing consumers' environmental needs can't be met with "greened" up products and cliched images. As described in Jacquie Ottman's award-winning book, "The New Rules of Green Marketing," the greening of the marketplace has brought with it a new paradigm, requiring new strategies capable of motivating today's brand of environmentally-aware consumers with a holistic point of view, eco-innovative product and service offerings, transparent communications, and an embrace of stakeholders to help get the job done. This workshop is designed to bring to life the principles, strategies, tools and frameworks detailed in Jacquie's book, "The New Rules of Green Marketing." Highly interactive in nature, it reviews emerging sustainability trends and provides an overview of key issues and challenges involved in green marketing. Practical in orientation, it equips attendees with critical strategies for product greening ("eco-design"), eco-innovation, communicating with credibility and impact, and partnering with stakeholders, illustrated with case examples from sustainability leaders worldwide. · Brand Teams who can work together to jumpstart a new project, or work on a marketing plan for a new green initiative. Can be delivered as a half-day primer for high level managers, or a one or two-day customized workshop for those looking for a more detailed immersion. 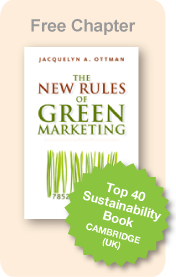 All trainings are based on the strategies and examples included in Jacquie's new book, "The New Rules of Green Marketing", now available in book stores and online globally. All trainings are taught by Jacquie Ottman or members of her team of experts. All trainings are customized to your team's needs and budget. Public workshops are available (in addition to on-site). 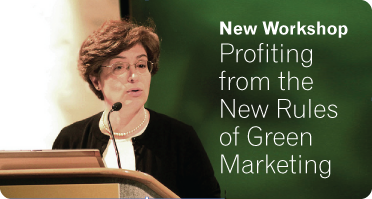 Link here to listen to a webinar on the topic Profiting from the New Rules of Green Marketing. 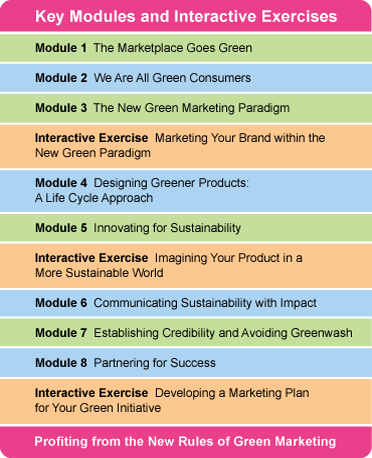 "Jacquie Ottman's "Profiting from the New Rules of Green Marketing" workshop is a superb course. This workshop provided San Diego Gas & Electric commercial customers with excellent insight into successful strategies for developing a green marketing plan for their products and/or services. Jacquie's expertise in green marketing and effective instructional methods are reflected in the workshop attendee survey results of 100% speaker satisfaction rating and 97% course content satisfaction rating. It was a pleasure working with Jacquie to coordinate this workshop for our customers. She was extrremely responsive throughout the planning process and delivered an extraordinary workshop. I'm sure all attendees will benefit greatly from her book as well"."